"Portland City Hall, viewed from Middle Street." Portland City Hall, viewed from Middle Street. Portland City Hall, viewed from south (U.S. Custom House, Middle Street). Exchange Street at left, Lime Street (Market Street) at right. "Portland City Hall, viewed from Middle Street." (1866). The Great Fire : 1866 - Stereoscopic views. 12. 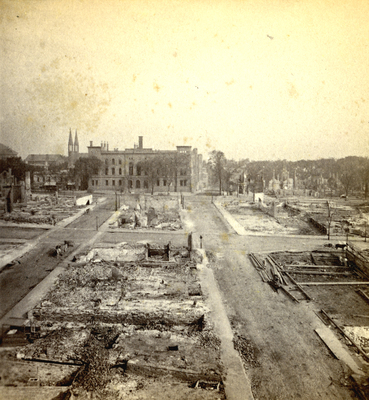 Portland, Me., Great Fire, Portland, Me., 1866, Congress Street, Portland City Hall.